The Washington Metropolitan Auto Body Association (WMABA) celebrated its 50-year anniversary with a membership dinner on Dec. 13 and a special surprise: WMABA President Torchy Chandler being awarded the Society of Collision Repair Specialists’ Regional Lifetime Achievement Award. Held at the association’s former stomping grounds of P.J. Skidoo’s restaurant in Fairfax, Va., the association reminisced on some history as well as looked to the future of the collision repair industry. With the event being emceed by Jeff Hendler, longtime industry mainstay and administrator of the Collision Industry Conference (CIC), those in attendance heard about WMABA’s history of being present at every national event or entity creation. While all those in attendance enjoyed a great meal, WMABA Executive Director Jordan Hendler showed the association’s 40-year history video to the group, then followed with a state-of-the-industry address. Discussing future technologies, such as artificial intelligence and autonomous vehicles, Jordan talked about how the future of our industry is in the hands of young people today who are familiar with technology and computers. Fifty-year members of the association were also recognized: Fairfax Auto Body, Hanagan’s Auto Body, NCS Coatings, Inc., and Ray’s Auto Body. The highlight of the evening was Aaron Schulenburg, executive director of SCRS, and Barry Dorn, Dorn’s Body and Paint, WMABA board member and SCRS past chairman, giving the Lifetime Achievement Award to Torchy Chandler, WMABA’s current president and longtime board member. 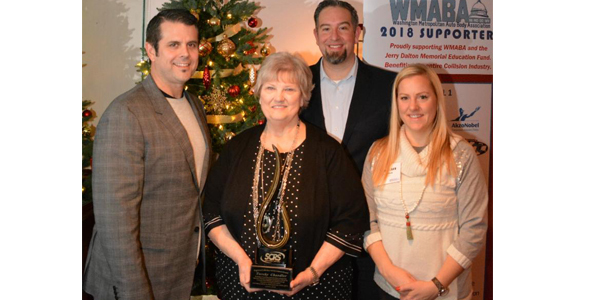 WMABA thanks all those who participated in the celebration, and encourages their continued participation and support of the association and the work it continues to do on behalf of the entire industry.